Are you committed to getting 2018 off to the best start possible, with a healthy body and mind? Learn the foundational movements, breath and alignment of ashtanga vinyasa yoga in a short but effective yoga sequence which will give you a solid grounding to continue onto any style of yoga. The ashtanga yoga practice is a strong and invigorating style of yoga that develops strength, flexibility and endurance, as well as a calm and focused mind. Students have reported decreased back pain, improved core strength and better sleep from their very first class. 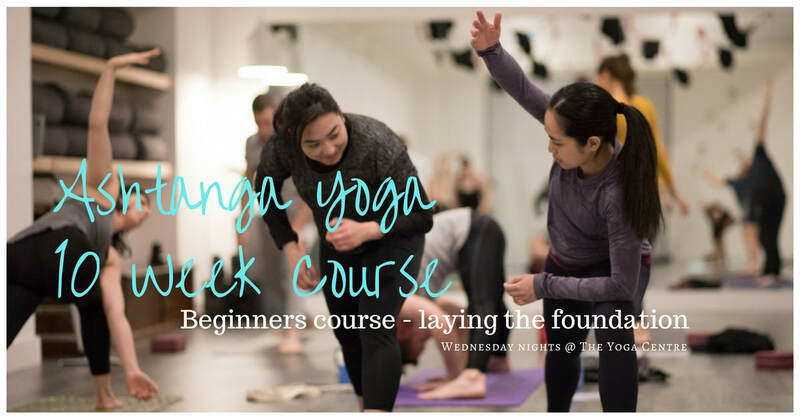 This course is designed for complete beginners - you don't have to be able to touch your toes to do yoga (although I guarantee you'll be a lot closer after just a few classes). We add 1-2 new postures to our sequence per week to leave us with a well rounded, complete yoga sequence by the end of the 10 weeks. This course is also a great technique refresher for students who have had some time off the mat. Students also receive a folder detailing the yoga sequence and a 45 minute online yoga video for practice at home. Beginner's course runs only once per year and sells out quickly. Small class sizes guaranteed with minimum 5 and maximum 10 per class. Great 2018 new year's resolution! *bring a friend* $10 discount each off 10 week course. Class passes expire after 10 weeks - students may make up missed classes at Monday night Yin yoga during the 10 week period. Casual classes permitted only if space permits. Also see my Facebook event page and share with your friends. This 75 minute Level 1 course is based on the principles of Ashtanga vinyasa yoga to develop strength, flexibility and endurance. Plenty of options are given so that everyone has a chance to practice at their own level. By committing to 10 weeks, students will continue to grow, build and uplift each other in their individual journey. like-minded yogis. No extra heat needed (we make our own!). Deanne combines her anatomy knowledge from her career as a pharmacist, as well as her massage training and over 20 years of yoga experience to create yoga sequences for athletes, utilising therapy ball work to release trigger points and knots. She works with several sports teams as well as holding regular Therapy Ball and Yin Yoga workshops for the general public to teach students techniques that they can easily do at home. She also loves the vigorous practice of Ashtanga yoga, a practice she has been dedicated to for over 10 years and teaches beginners courses in this style of yoga.